Right, so what does this mean for estate agents? You know about the properties in your area, you know the local schools, the events taking place. Perhaps you sponsor the village or school fayre. You know the distance to the train, tube and tram stations. All the practical things your clients want and need to know, that is what hyperlocal is. Think about the other things outside of this such as sharing news and offers from the local shops and businesses. When you share, you care. Show your knowledge of the area you’re doing your business in by showing the area. We know you can sell your home, that’s your job, but don’t forget the client is buying into the area also. So make the process holistic. Serve your local community not just with property updates, but with community updates too. So how do you do that then? Well let’s take your social channels: we’re already assuming you mention properties available and services your offer. Keep doing that, but remember a rule 80/20 - less about you and more about the community. For example, when you follow a local shop like, comment and share their post that you know your community will enjoy. For instance Boxpark Croydon is local to us. We like breakfast, lunch and dinner for that matter, we support our community so we like to share this. Boxpark is very popular with the local community and we believe our community of followers will appreciate this too. 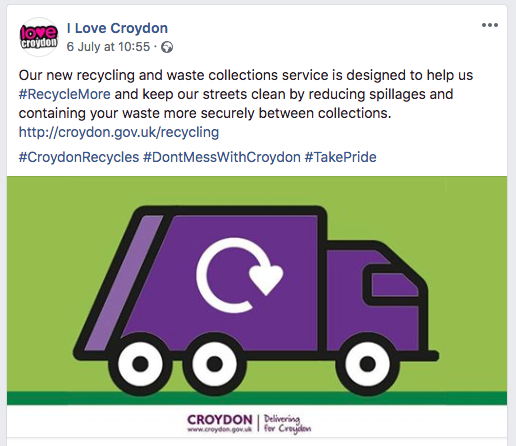 Local councils share information your clients would be interested in knowing, such as refuse collection dates and times like our council (Croydon Council). Again, this is helpful for the community and they’ll thank you for it. Don’t forget if you have a newsletter you send to clients you can also share this community information here. We’ve talked about branding before. Essentially who you are offline needs to be replicated online. Be the agency that doesn’t just say “I have a house that you suits your needs”, but also says “I know a local theatre your kids will love” when you’re out on viewings. Tom Panos is the world’s number one estate agency coach and he says “local business are [going to be] shot callers of that [hyperlocal]”, so you’re selling the house, yes, but you’re selling the area the house is in. Tom says further “Immerse yourself in your community, establish yourself in the market not in the office”. Our client Rockett Home Rentals does this really well with their loyalty card. Being hyperlocal means you get specific in your area, you become highly specialised and the “go-to” agency not just because you give great property advice but you also know a thing or three about the area. If you’d like more advice on how to make your digital marketing strategy more hyperlocal do get in touch.